This customary has been prepared for all those considering baptism at St. John’s Episcopal Church. We hope this summary will answer questions and help you, your family, and the candidate’s sponsors to prepare for this first step in the life journey of a Christian. WHEN CAN ONE BE BAPTIZED? Holy Baptism is appropriately administered within the Eucharist as the chief service on a Sunday or other feast, It is especially appropriate at the Easter Vigil, on the Day of Pentecost, on All Saints’ Day or the Sunday after All Saint’s Day, and on the Feast of the Baptism of our Lord (the first Sunday after The Epiphany. It is recommended that, as far as possible, baptisms be reserved for these holy days or occasions when a Bishop is present. (The Book of Common Prayer, pp. 298 and 312). For an adult or adolescent, his or her expressed desire to be baptized. For a pre-adolescent child, his or her expressed desire, along with the consent of their parent(s) or guardian(s). For an infant, the expressed desire of the parent(s) or guardian(s) and assurance of their faith in Jesus Christ. 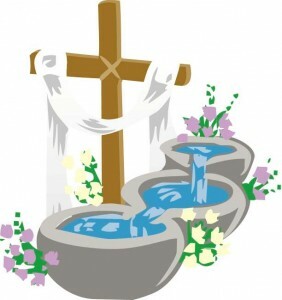 Prior to scheduling a Baptism, the Rector/Vicar/Priest-in-Charge, of St. John’s Episcopal Church will meet with the adult or adolescent candidate, with parents and godparents to discuss the theology of the sacrament of Holy Baptism. If an Episcopal Priest, or any other member of the clergy, other than the current Rector/Vicar/Priest-in-Charge of St. John’s Episcopal Church is desired to assist or officiate, the permission and invitation of the current Rector/Vicar/Priest-in-Charge of St. John’s Episcopal Church is required according to The Canons of The Episcopal Church (Title III, Canon 9, Section 5a). Although such permission normally is gladly given when requested, this is a matter that can neither be assumed or bypassed. Christian baptism is rooted in the ministry of Jesus of Nazareth, in his death and resurrection. In this sacrament, God adopts us as God’s children and incorporates us into Christ’s Body and the Church. In Baptism we enter into the new covenant between God and God’s people, and thus we are baptized in the name of the Father, and of the Son, and of the Holy Spirit. The Gospel of Matthew records that the risen Lord, when sending his disciples into the world, commanded them to baptize (Matt. 28:18-20). We read of the universal practice of baptism in letters of the New Testament, The Acts of the Apostles, and the writings of the church fathers. These writers recognize that Baptism is essential for the life of the Church. We are baptized into the holy catholic Church and not into any one denomination of that Church. This bond that God establishes in Baptism is indissoluble and therefore we are baptized only one time. If the candidate for Baptism is a child or young adult, parents invite sponsors, also called godparents, to take part in the service of Holy Baptism. These persons, between one and four in number and at least one whom must be baptized, and at least 17 years of age, are responsible for seeing that the candidate is nurtured in the Christian faith and life, so they should be carefully chosen with this charge in mind. In extending this invitation to sponsors, parents should bear in mind not only the personal qualities of the individual but also the person’s readiness to serve as a spiritual mentor and guide to the person throughout his or her life. The Book of Common Prayer goes onto say that sponsors of adults and older children present their candidates and thereby signify their endorsement of the candidates and their intention to support them by prayer and example in their Christian Life. Sponsors of infants, commonly called godparents, present their candidates, make promises in their own names, and also take vows on behalf of their candidates. It is fitting that parents be included among the godparents of their own children. Parents and godparents will be instructed: 1) in the meaning of Baptism, 2) in their duties to help the new Christian grow in the knowledge and love of God, and 3) in their responsibilities as members of God’s Church. In case of an emergency, any baptized person may administer Baptism as outlined in the BCP on pages 313-314. The current Rector/Vicar/Priest-in-charge must be notified as soon as possible so the fact can be properly registered. If there is reasonable doubt that a person has been baptized with water, “In the Name of the Father, and of the Son, and of the Holy Spirit” the person is baptized in the usual manner, with a change in the form of words as outlined in the BCP on page 313.